1) To start off could you tell us a bit more about your latest book Liberty's Fire? Think Les Mis; then fast-forward nearly forty years to 1871. The French capital’s been transformed by developers, there’s been a disastrous war with Prussia, and the divisions between rich and poor are wider than ever. Enough is enough for the people of Paris. 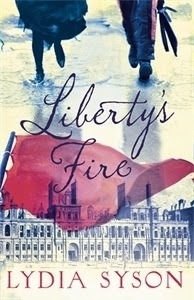 Liberty’s Fire is about a group of young people caught up in a revolution that quickly turns to civil war. Zéphyrine once made artificial flowers for fancy dressmakers. Now she’s sewing sandbags with her friend Rose and working in a soupkitchen. They’re both hoping that the Commune, newly elected to offer Paris a radical alternative, will change everyone’s lives for the better. But Zéphyrine is torn. Anatole, a gorgeous young violinist at the Théâtre Lyrique, has opened her eyes to a luxurious new world. When he in turn is swept up by both Zéphyrine and her passionate politics, where does that leave Jules, a rich American photographer who is secretly in love with Anatole? Meanwhile their friend Marie, an ambitious opera singer, is desperate for word of her brother, a soldier in the French army now massing outside Paris. She’s horrified by the actions of the Commune. The barricades are rising once more. The call to arms rings through the city. Can the Commune – and more to the point our characters – possibly survive? 2) The history you cover in this book is covering an area in history I knew nothing about despite having a degree in Modern European History. Can you tell me why you decided to write this particular time in history and specifically about the Paris Commune. You’re not alone! This was a big hole in my knowledge too! But everything seemed to lead me towards the Commune. At the launch of A World Between Us, my YA novel set during the Spanish Civil War, we sang a song called the Internationale, which I’d sung at my grandparents’ funerals: ‘Arise, ye starvelings from your slumbers! Arise, ye prisoners of want!’ It was composed at the fall of the Paris Commune, and united the International Brigaders in Spain because in the 1930s it was familiar to workers all over the world. Sometimes they sang it in many different languages at once. Then I discovered that in the 1890s my great-great grandmother had taught at a school in London run by a revolutionary heroine of the Commune, Louise Michel. Michel was an extraordinary character – she appears in Liberty’s Fire – and she had two International Brigade battalions named after her. Finally, I went to the film of Les Mis with my daughter. As we came out, I overheard people talking about ‘the French Revolution’ – as if there had only been one – at which point I decided that I really had to write a Paris Commune novel. Passion, idealism and barricades are such a great combination. As soon as I began research proper, I was hooked. The title came to me straight away, and it’s the only book I’ve ever written which has kept its title from beginning to end. 3) How did you go about researching for this book? One thing always leads to another, and the detective work is all part of the fun. From general histories and academic journals, I was led to memoirs, both pro and anti. It quickly became clear how many people hadn’t survived to tell their side of the story, or hadn’t had the education to make this possible. Working-class voices are hard to hear in history! I often wished my French was better. I read lots of novels by French and English writers set in Paris around that period or directly about the Siege of Paris and the Commune – a time known as France’s ‘terrible year’. Maps and photographs played a big part in my research too, but most important of all were a couple of pavement-pounding trips to Paris. Some days I spent in far-flung museums and archives, looking at everything from ratbones to banners, others I wandered and wondered. One of the last battles of the ‘Bloody Week’ that brought the Commune to an end - the French army entered Paris and slaughtered thousands - was fought at the cemetery of Père Lachaise. Oscar Wilde’s grave is not far from the memorial wall where many Communards were executed, and this helped me see the character of Jules more clearly, and the importance of idea of ‘the love that dare not speak its name’. Homosexuality wasn’t technically illegal in France, as it was in England, where it only stopped being a capital offence in 1860, but police used other laws to persecute gay men. I thought a lot about the figure of the flâneur, aimlessly strolling through the modern city, watching the world go by, and also about spectacle (lots of nineteenth-century accounts treat the Commune as a kind of theatrical experience), and I read widely about the sexual politics of the time. Women were heavily involved in the Commune. And I listened to music and found out about photography. I’d hate anyone to be put off by the amount of research I did – which, I should gratefully say, was largely funded by an Arts Council Grant – because the whole point of doing it was to create the right atmosphere and feel and narrative for a work of fiction. I just want the reader to be swept up in the story. 4) Historical fiction needs a good balance of accurate historical fact and interesting story to make me want to pick it up and sometimes I find in some historical fiction one is sacrificed for the other whereas you seem to get the balance right. How do you make sure your stories are exciting and engaging whilst still staying true to the period of history being covered? Thank you very much! I certainly make every effort to keep the ‘story’ in history in every way, and I really hate the idea of history as mere ‘backdrop’. The revision process is particularly important. That’s when you tend to spot any dangerous drifting out of novel-writing and into a lecture. As you’ll have gathered, I do a ridiculous amount of research, but ironically I think the more an author does, the less it tends to stick out. So my characters and narrative always spring from real historical events and are woven round a completely accurate chronology, rather than fighting against it. To be honest, I find the times I’ve written about so exciting and engaging in themselves, it’s not hard to stay true to them. And if I’ve sown a few seeds, and anyone wants to find out more about the history, there’s a full guide to my research sources on my website. 5) Are you already working on another book? Or do you have ideas about what you'd like to work on next? I’m at the very early stages of a new novel for Hot Key books called Blackbird Island. I don’t want to say too much right now, but it’s set in the Pacific, also in the late nineteenth century, and this time I’ve plundered my partner’s family history for inspiration. Writers can be terrible thieves. Great interview! Already love the sound of the new book.